Location: 3F, International Trade City D5. 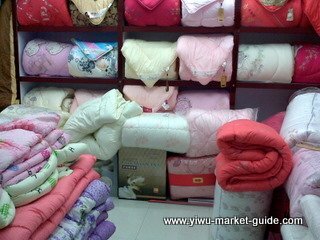 Bedding and home textile has a 20+ years history in Yiwu. 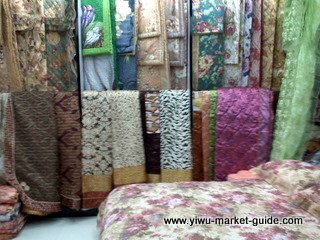 This new market was moved from old bedding and home textile market in old Binwang market. Products in this market are mainly from Nantong in Jiangsu province and other cities in Zhejiang province like: Dongyang, Pujiang and Yiwu itself. Over 60% of the products in this market are exported to the Middle East, Europe and America and South America. 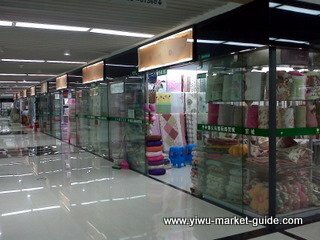 After 20 years development, this market now has a big variety from bedding, to mattress, to table runners to curtains and pillow stuffing. Cotton, silk, linen, nylon products are all available. You can also find the latest technology material like bamboo fiber products. 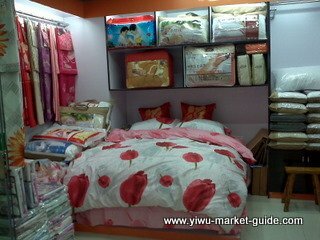 This market also has a good range of kids beddings and tents, plus a range of pets products. Hotel beddings are also available. 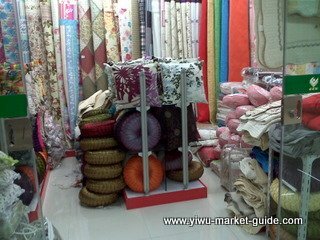 As exportation to the middle east keeps increasing, Islamic theme bedding and textile products are also quiet common in this market.